Zikhona Bali is a South African actress best known for her recurring role as Ziyanda on the SABC1 drama series Mfolozi Street. Having matriculated from Riebeek College Girl's High School, she did a Diploma in Media Studies and Journalism at Boston Media House, from 2008-2010. After that she worked as a photographer, writer and marketing and PR assistant. In July 2014 she made her screen acting debut as Ziyanda in Mfolozi Street, a role she reprised in Season 2, in 2016. 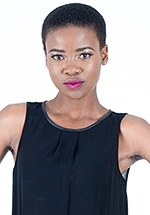 In 2015, Zikhona appeared in a number of television series with roles in the Mzansi Magic soapie Zabalaza, the e.tv soapie Rhythm City and the SABC2 sitcom Gauteng Maboneng. Zikhona played the lead role in an episode of the e.tv drama anthology series eKasi: Our Stories entitled "Thula Thula", about an ambitious young girl whose plans are derailed when her Uncle abuses her. The episode first aired on Monday 11 January, 2016. In the same year she guest starred in the fourth season of the e.tv drama series Umlilo. In October 2016 she landed her first starring role in television, on the Mzansi Magic teen drama series Is'thunzi, which follows the exploits of four girls who call themselves "Ninjas". She plays Londi, a young wife who defies her in-laws by returning to school to get her matric.